Many movies and quite a few tv series are based on book adaptations (and sometimes the reverse is true; Twilight, for example, is arguably a Buffy the Vampire Slayer fanfic). Working from a book provides a crutch for Hollywood studios which are now afraid to produce original stories. It also often gives a clearer storyline to the film, and enables it to have a more solid plotline. 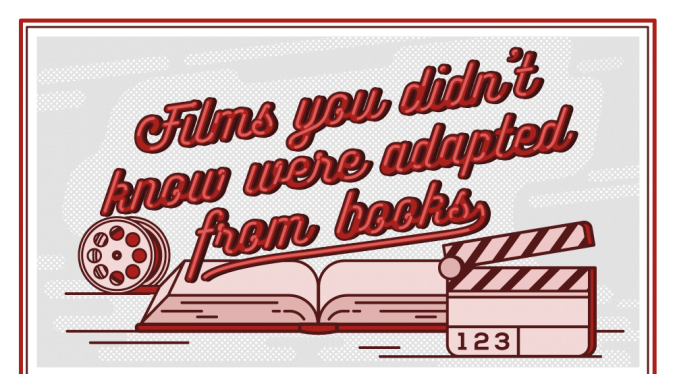 While some films may be directly linked to the novels that they are based on, it might surprise you to know that some of these films were indeed based on books. For example, did you know that the SF thriller Children of Men was also a novel PD James wrote in 1992, and Forrest Gump was a novel written in 1986? Jonkers Rare Books has crafted an infographic which connects several movies with their source book. Do you see any pairings which surprise you? Guest Post: Can Reading Fiction Literally Change Your Mind? Is B&N Really Attracting Readers While Repelling Authors? i would add World War Z to this list… oh no, wait, that was a dreadful movie. nevermind. I agree. There weren’t enough white guys in it saving the world. Directors and screenwriters are often criticized when they take too many liberties with popular novels but sometimes it works. Robert Wise’s film of “The Sand Pebbles” is vastly different from Richard McKenna’s book but both are excellent in their own right. Some of the James Bond films bear only the vaguest resemblance to the Ian Fleming novels they’re based on.